The ID Chair Concept is a versatile office swivel chair collection by Vitra and was designed in the years 2010 to 2012 by the Italian designer Antonio Citterio, a designer responsible for the Vitra lounge chair Grand Repos, for instance. 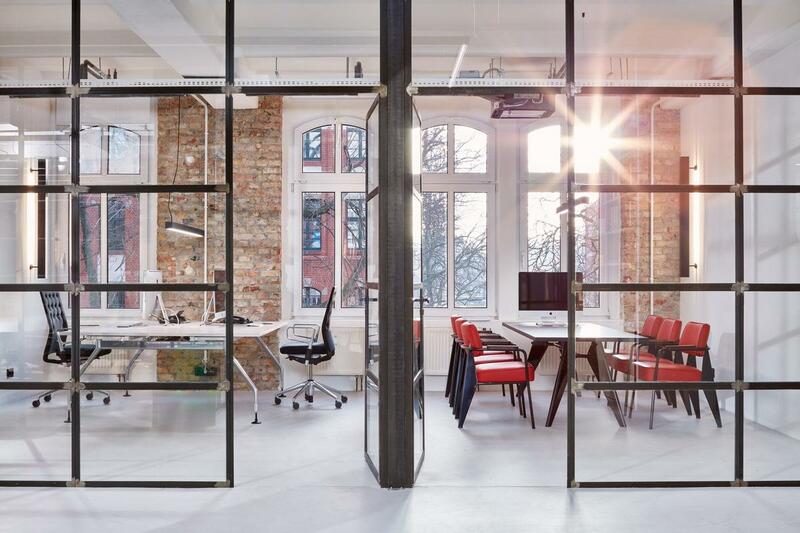 Primarily, however, the designer concentrates on individual solutions for the work and conference area, solutions that are technically and visually impeccable in every variation. The ID Chair is a family that combines high standards in terms of functionality, economy, and aesthetics and which through its numerous individual configuration options also takes into account both the needs of employees and the company. With the ID Chair Concept, Citterio intended to react to the different requirements of office work. This is not only noticeable in terms of functionality, but also in terms of appearance and value of each model. With the Vitra ID Chairs you can , for example, not only choose between many different seat covers, but also armrests and the ergonomic features as well as the frames and upholstery. With countless variations, ergonomic solutions and texture, the ID Chairs are ideal not just for every need, but also for every budget. 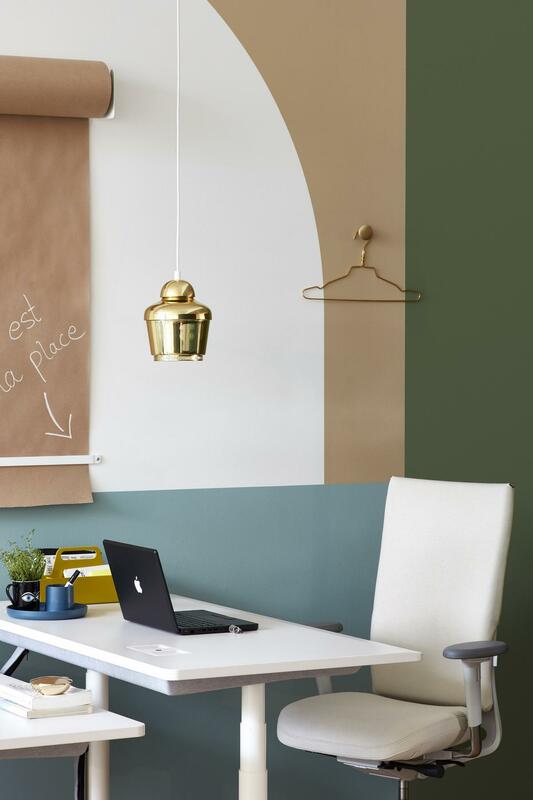 The ID Chair, in its countless versions, is produced by the Swiss manufacturer Vitra. With its patented backrest it is characterized by the fact that it is very flexible, but still offers enormous stability. Freedom of movement is possible without sacrificing a healthy sitting posture: seating comfort is maintained even after many hours of sitting - this is ensured not only by the flexible backrest, but also by the soft seat cushion and the particularly effective air circulation in the back area. Last but not least, thanks to the wide variety of colour combinations, individual needs are not neglected in the ID Chairs. The ID Chairs are manufactured under the strict Vitra production standards, which place not only extraordinary value on quality and longevity, but also on environmentally conscious production. Vitra itself was founded in the early 1950s by Erika and Willi Fehlbaum and made a name for itself, especially through the production of furniture by the American manufacturer Herman Miller for Europe. Today the company has evolved and Vitra also produces numerous leading contemporary designs for the living and working area. 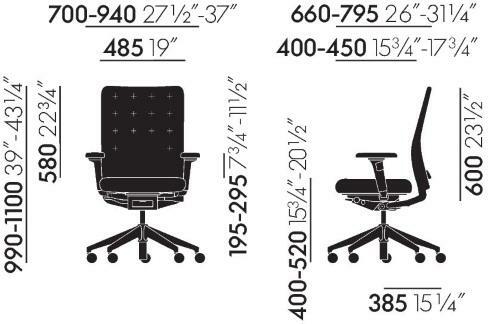 The patented technology of the ergonomic ID Chairs supports healthy and uncomplicated sitting. The Institute of Biomechanics at ETH Zurich has demonstrated with MRI and EMG measurements that the use of the synchronous forward inclination of the patented "FlowMotion" mechanism activates the muscles and sets all segments of the lower spine in motion, with a health-promoting effect. Due to the negative inclination, the spine is set erect and relieved when sitting on the leading edge. The ID Chair ensures dynamic movement and support with individual counterforce in both directions of movement. Designed by Antonio Citterio from 2010 to 2012, the ID Chair Concept comprises six different chairs, each of which can be customized. The final configuration of the ID Trim, ID Trim L, ID Trim Conference, ID Air, ID Mesh and ID Soft cannot only be selected from a wide variety of cover types and colours - the functional diversity in particular makes the Vitra ID Chairs tailor-made office chairs. For example, the chairs with FlowMotion technology can be individually adapted to a user via various settings. 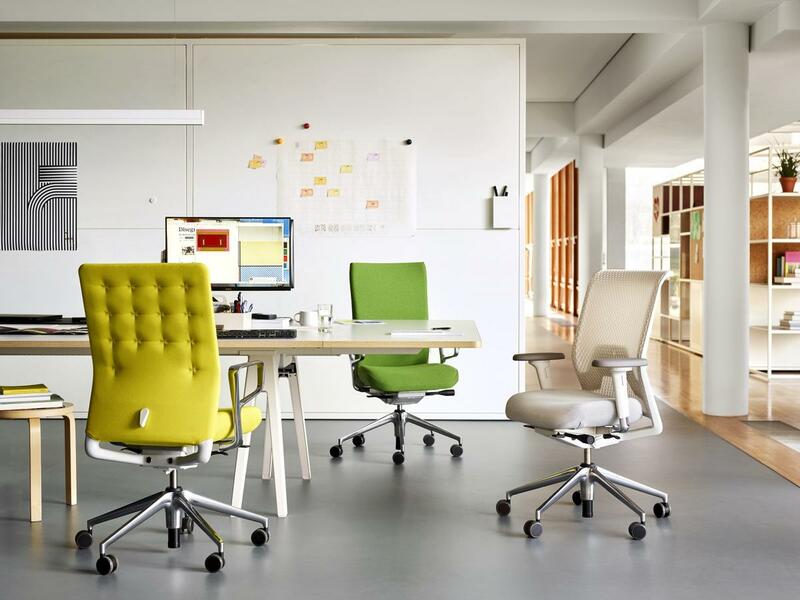 All in all, the Vitra ID Chair series offers ergonomic seating for single and open-plan offices, conference rooms, and executive workstations. In spite of all the available customisation, the Vitra office chairs create a harmonious picture thanks to their overall aesthetic concept. 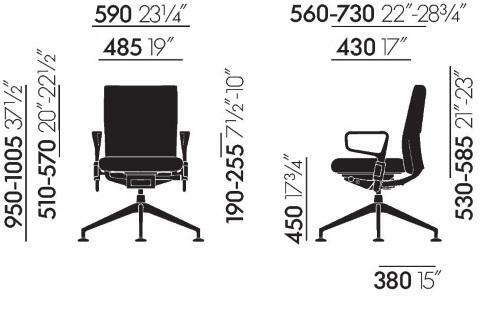 The Vitra office swivel chair family consists of many building blocks that meet a wide range of aesthetic, material, purpose, and price requirements. The Vitra ID Air office swivel chair is one of the various models from the ID Chair Concept. Thanks to its perforated plastic backrest, the ID Air is easy-care and offers excellent air circulation. It is available with or without 2D or 3D armrests and has a five-star base made of die-cast aluminium or black polyamide. With its back made of perforated plastic, the ID Air is particularly light and airy. 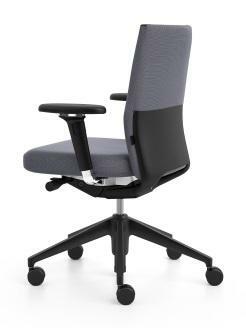 Like its colleagues, the ID Air chair has ProMatic mechanics which adapt to the occupant. A further component of the ID series is the Vitra ID Mesh. 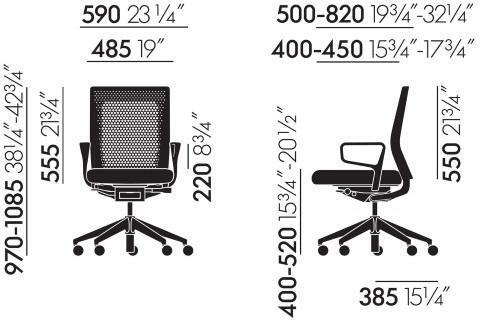 As a chair the ID Mesh distinguishes itself from the other ID office chairs through its frame construction, which is covered with a special 3D mesh that provides ideal air circulation and a very pleasant cushioning effect. 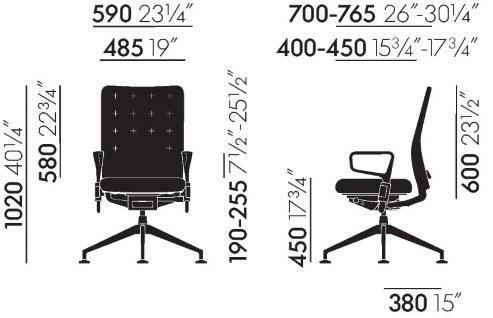 Different armrest versions as well as optional forward tilt or seat depth adjustment can be additionally selected. 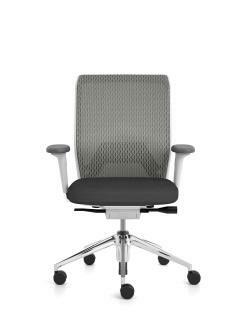 In addition, the ID mesh has an optional lumbar support, which ensures that the back remains in the correct posture. 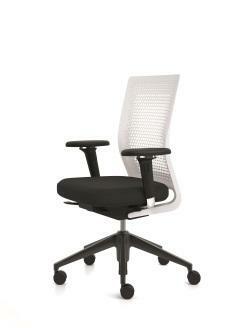 The Vitra ID Mesh is available with Plano or Silk Mesh covers for the seat and Diamond Mesh for the back. The office swivel chair ID Soft is characterized by its configurability and good compatibility with the other ID chairs. In addition, it impresses with its upholstery, which ensures high seating comfort. Available in a variety of colours and materials, the ID Soft has the potential to become the centerpiece of any business. It can be individually configured with either FlowMotion or ProMatic mechanism.It is also possible to choose between 2D armrests or 3D armrests or no armrests. In addition, the family features the ID Soft Black Special with 2D armrests and impresses as a special edition with the black fabric Trevira CS. The seat and backrest allow for high comfort thanks to their polyurethane foam upholstery. Furthermore, the Vitra ID Soft Black Special is equipped with the FlowMotion mechanism. Design, ergonomics and functionality go hand in hand with the Vitra ID Trim. The seat and the slim backrest provide a high level of comfort thanks to the polyurethane foam padding, while the upholstered chambers of the backrest offer a pleasant supportive effect and ensure ergonomic sitting. The plastic frame in combination with the upholstery chambers allows a three-dimensional movement of the backrest. 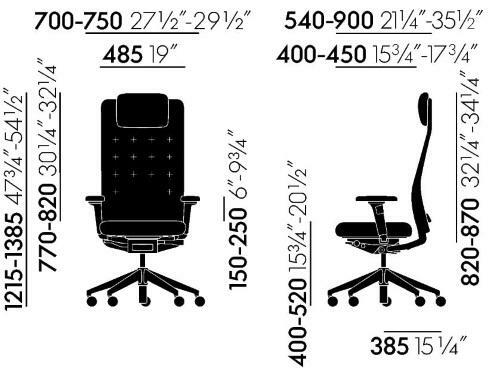 The integrated, optionally height-adjustable lumbar support contributes to optimal support of the lumbar area. 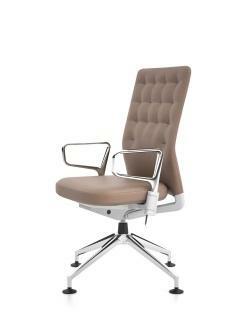 The Vitra ID Trim swivel chair is available with both the ProMatic and or the FlowMotion mechanism. 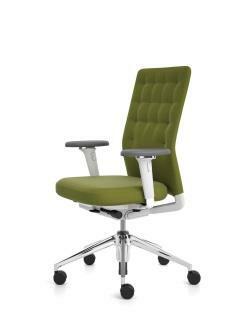 The ID product series also includes the Vitra office chair ID Trim L, which is individually configurable. Particularly striking is the high backrest of the ID Trim L, a feature which allows for comfortable sitting even during prolonged periods of sitting. The quilted upholstery bequeaths the backrest an elegant look, and at the same time prevents the cover from slipping. The Vitra ID Trim L is available with a range of mechanisms, either in the FlowMotion version without forward tilt with seat depth adjustment, in the FlowMotion version without seat depth adjustment or as ProMatic version without seat depth adjustment. The ProMatic mechanism adapts to the weight of the occupant, making it ideal for users who want to use the Vitra ID Trim L swivel chair as a seat in the short to medium term, as is the case with touch-down workstations. 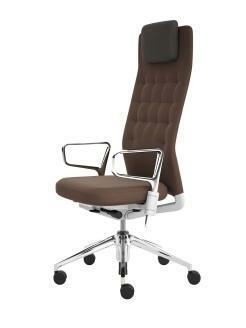 The ID Trim L comes in a noble leather cover and can be purchased with 3D or slightly slimmer ring armrests. The functional and at the same time highly elegant design of the office swivel chair ID Trim Conference combines with its many ergonomic features the advantages for optimal seating in meetings and conference halls. Featuring the ProMatic mechanism, its slim, upholstered backrest ensures high seating comfort and supports the back through its various supportive zones. 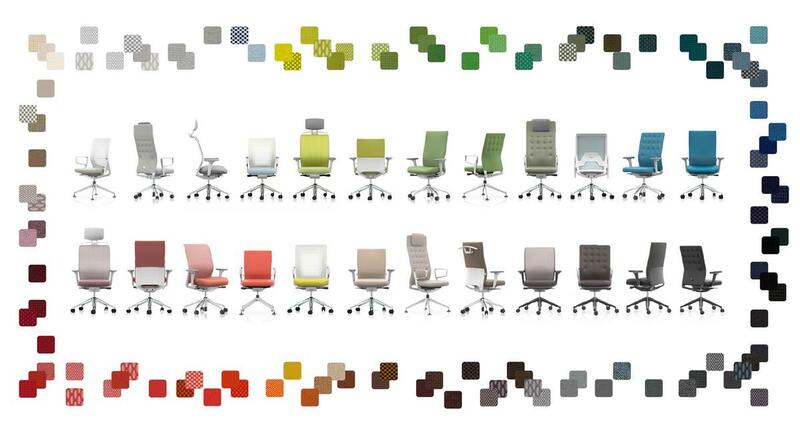 The ID Trim Conference comes in a variety of styles: with or without lumbar support, with or without ring armrests - in addition the Vitra ID Trim Conference office swivel chair is available in a wide range of colours and materials, making it a versatile option for any business.